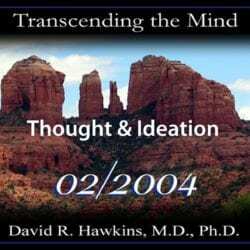 View cart “2004 Lecture 1 “Thought and Ideation” February 2004 (CD)” has been added to your cart. In “Witnessing and Observing”, Dr. Hawkins presents important information, such as the fact that everything happens spontaneously and that nothing causes anything. Everything is an automatic consequence of the energy field. He shows how the power of one’s intention brings about manifestation, and how potentiality becomes actuality in and of itself because of the field. He explains the use of kinesiology, why people may not believe in it, and how the infinite field of consciousness instantly registers Truth. 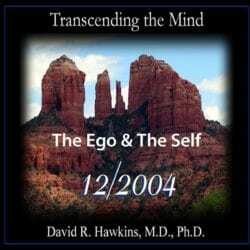 He discusses the calibratable level of consciousness at birth, its relationship to karma, karmic inheritance, and how we can undo past karma in this lifetime. Dr. Hawkins talks about Love as a quality of Divinity; about guilt; and about how to advance one’s level of consciousness. He explains the nature of resistance and spiritual truth. People cannot tell truth from falsehood and are simply doing what they think is good. He discusses the nature of power vs. force; that there is no opposite to truth; the nature of the Heisenberg principle and its relation to the process of intention as well as collective intention. He tells how we can uplift society by virtue of what we have become. Questions are answered at the end of the lecture and include topics such as chronic illness, unconditional love, schizophrenia, kundalini energy, the etheric brain, karma and karmic inheritance, some of the effects and benefits of doing spiritual work and being aligned with integrity, and the necessity to avoid evil and negative people.